Not long ago, I shared a picture on Facebook that really went crazy. 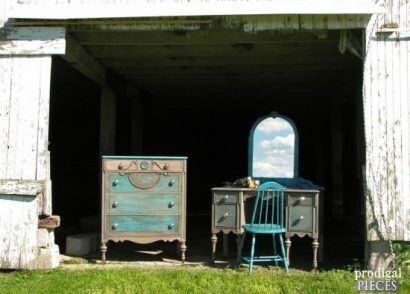 It wasn’t of a furniture piece I had thrifted and refinished, or of a DIY room remodel. Nope. It was a picture of my sewing fabric storage. My sewing space has been an evolving process and is always being tweaked to suit me better. Rarely these days do I get much of a chance to sit in my hallowed nook, but on occasion I make time to do what I love. SEW! I have moved my sewing desk from one place to another over the years because I needed somewhere well-lit, and easy to access on a whim for a quick repair. My notions and fabrics have been stored at up to 3 different places at the same time and it was driving me crazy to not have it all in one spot. Then it hit me. 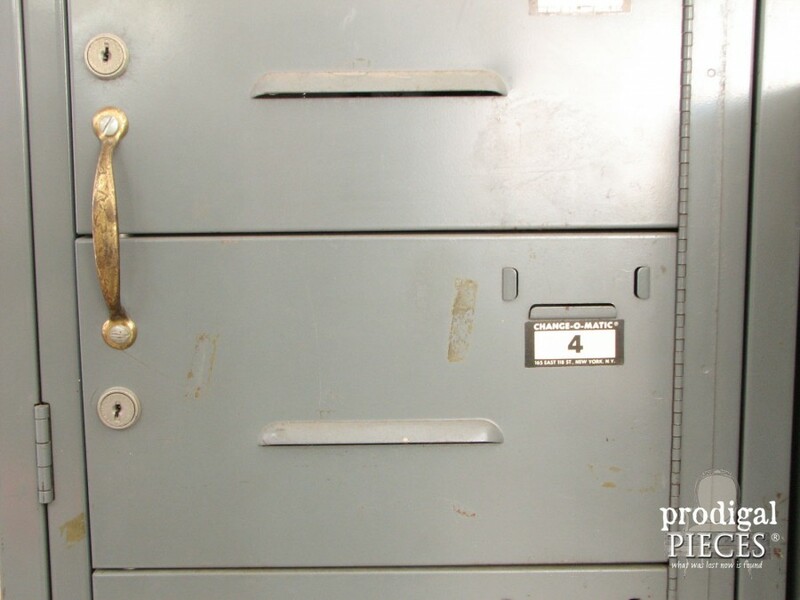 Why not make it look funky while functional, and use something most people overlook…office filing cabinets. You know they’re all over and people are aching to get rid of them because they are “in the way” or they don’t need them anymore. Finding them is half the fun! 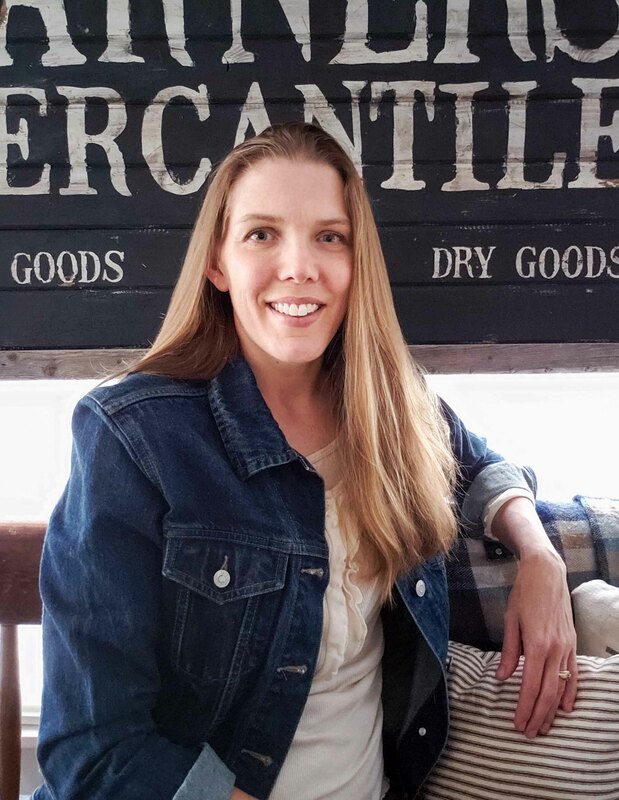 After scoring my desk and curbside chair (my favorite piece of furniture in the whole house next to my new chair, that is), I went on a hunt for industrial style storage. My first score came via Craigslist. I love that place. I was expecting our baby and not wanting to send my husband to far away to retrieve something. 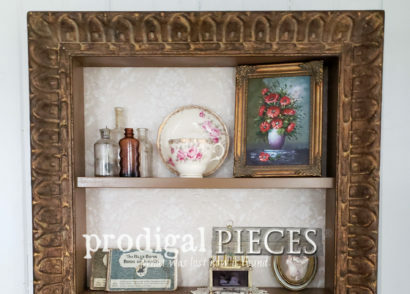 The gentleman was selling it for $50 – a huge dark gray four-drawer beauty. It was located about a half hour away, and I told the owner if he delivered I would give him full price. It was delivered the next day…tee hee hee! Never thought someone could be excited about a filing cabinet could you? You might be wondering how I would take a rusty crusty filing cabinet and use it for fabric? Well…by utilizing hanging file folders as hangers it made for easy access to my stash. I’ve organized it by use (apparel, upholstery, home decor, etc.) and I can’t tell you how easy this has made my life! The second industrial beauty I acquired was this awesome locker that had been used by a church puppet ministry to store their puppets. The previous owner had bolted the doors together to create one door, instead of five, and added handles for ease of opening/closing. The locker is for my notions, so I created cardboard cartons to be like shelves I can slide out and take with me to my desk , or wherever I’m crafting. 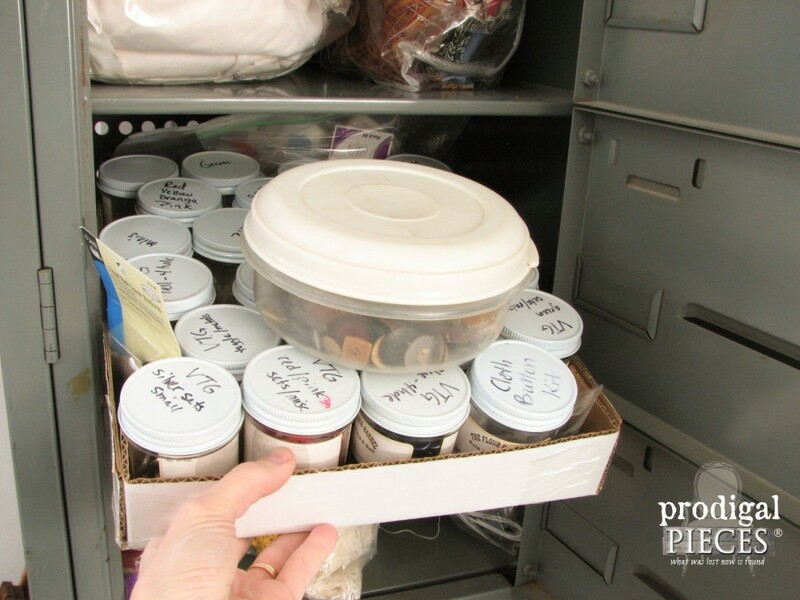 My assortment of vintage and new buttons are stored in repurposed spice containers from our local bulk food store. This is my favorite storage piece! 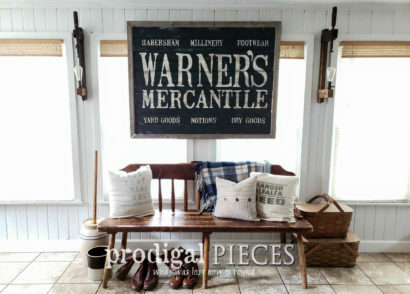 My third addition was similar to the first filing cabinet, but this one would be for my large yardage and miscellaneous. I dont’ feel like I’ve really maxed out this cabinet yet, but it’ll come to me how to make the best use of it. My little baby decided to come early before I could really set it up. At this point you may be thinking that I’m all organized and ready to craft, but sadly, I still don’t have everything in one place…yet. I’ve still got my yarn, my collection of miscellaneous scraps (they are all color sorted and labeled into plastic bins, but are not in my sewing nook), and all my other utility fabrics and more all in other places for now. One day it will all be in the same place, but for now I’m quite pleased with the start I’ve made. How do you organize your craft/sewing room? If you’ve got a DIY on making it great, just submit your project by clicking the button below or the tab in the top menu for a stand-alone feature! I’d love to see what you’ve got. You are so organized. Love the file cabinet idea. 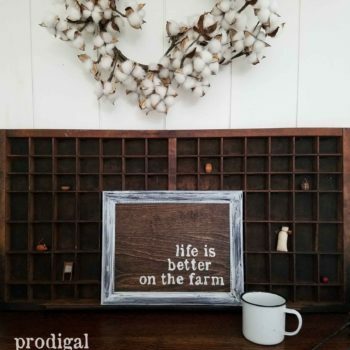 Your craft space is wonderful and looks like a fun spot to create things. I spied that old Smuckers gift box right away – I used to work for them many years ago. I FINALLY have my own craft room and have almost finished setting it up. I have an old wardrobe that has drawers on one side and I stored my material in there. I didn’t have that much material yet. I have been looking for a dressmaker dummy but so far no luck – only sizes 2 and 4 – not even close. I am going to attempt a quilt very soon. I was shocked I had as many craft things. When I assembled them in one place, I was very surprised but had a place for everything. One day I will take pictures and share but not yet. Thanks for the ideas, I will store them away for future use. Thank you. 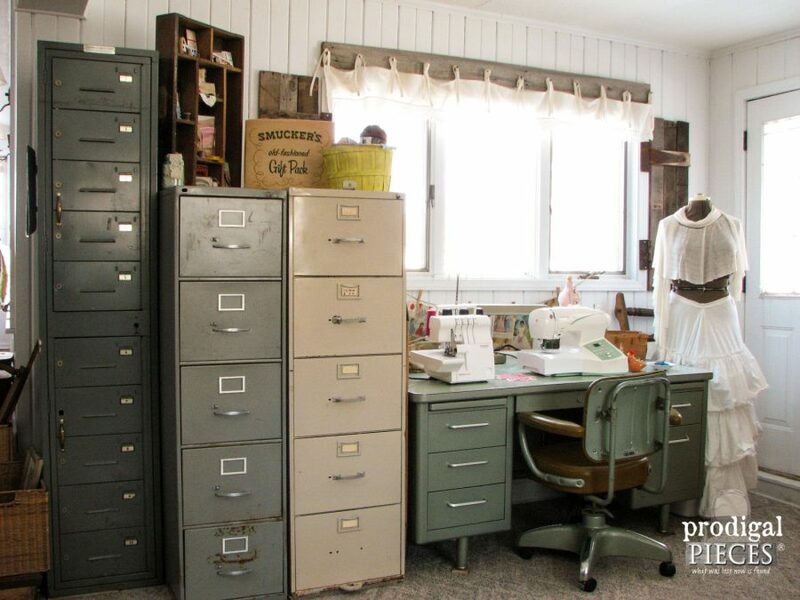 What a great idea to use the old metal file cabinets — I love it! Thanks so much for sharing. I have sewing room its very organized. My sewing cabinet is open on the bottom. I have two large baskets that are filled with my material. I roll and rubber band them and stand them in basked color coordinated. The smaller pieces are arranged the same way in the other basket. I love your ideas too! I like the way your organize, Ellie. 🙂 Any organization is key to sanity, at least in my mind. If I don’t do it, I’ll never make use of all that wonderful fabric because I forget I have it – out of sight, out of mind. Thanks for sharing! BRILLIANT, you are. 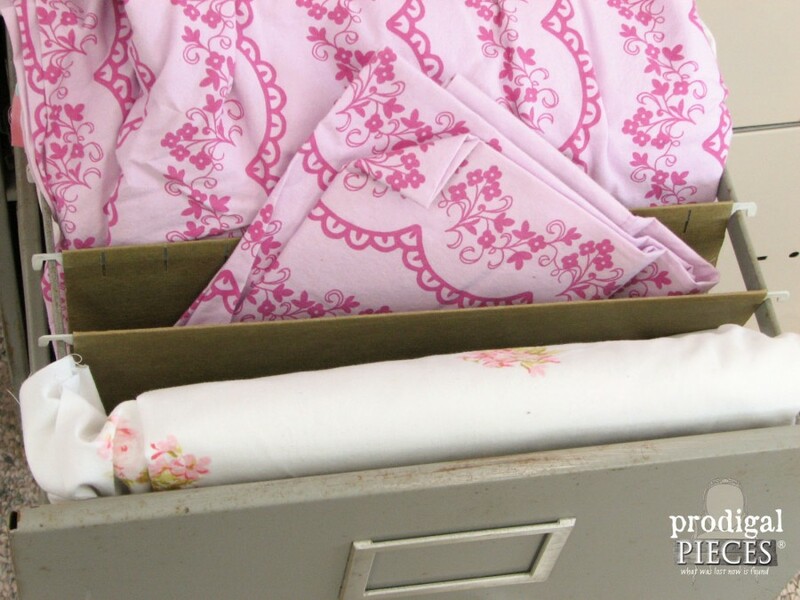 I love, love, love the file cab idea for fabrics! 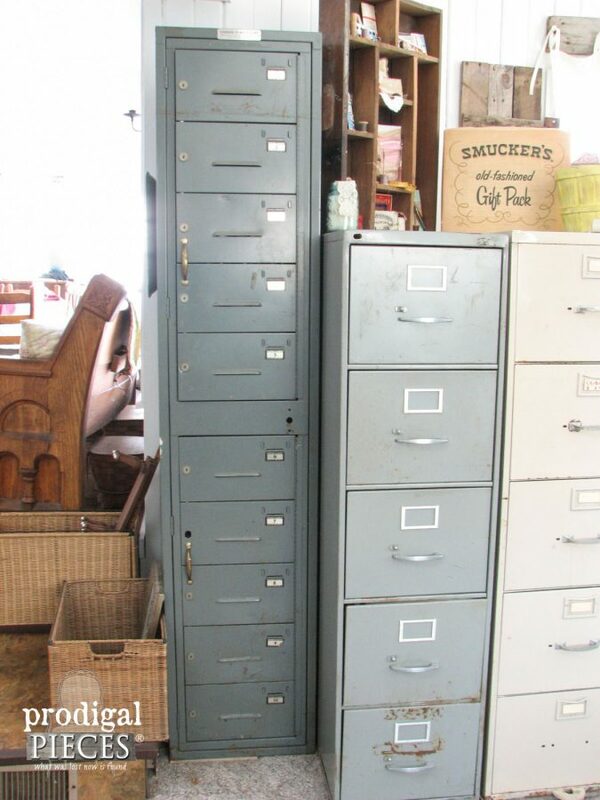 Love the file cabinets…so great! Hi Larissa!!! This is my first visit to your blog. Your sewing room organization is wonderful!!! 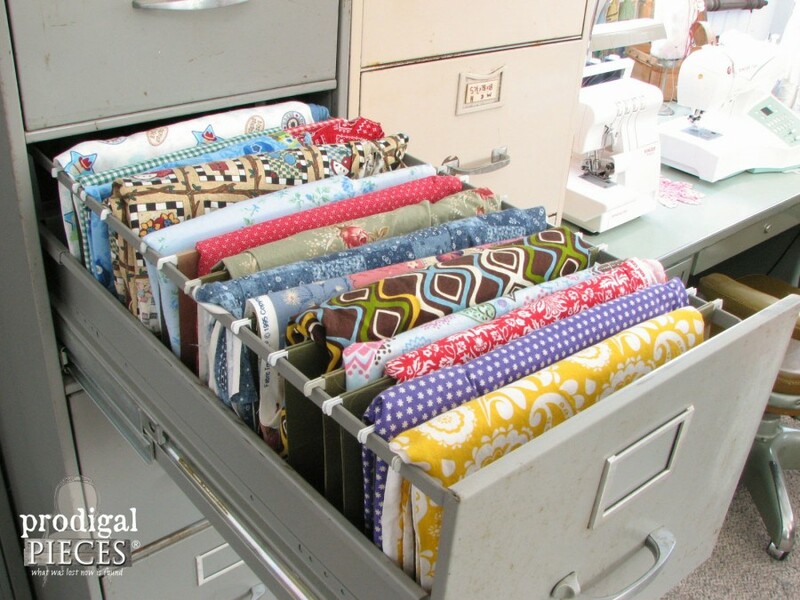 The filing cabinet idea is great for keeping all your fabrics easy to see and at hand. However, I noticed that some of the drawers have rust and marks on them. I would like to suggest taking each drawer out of the cabinet emptying them out and spray painting them in a bright and happy color(s) that will coordinate and make your sewing experience much more enjoyable!!! Also paint the cabinets themselves to match. 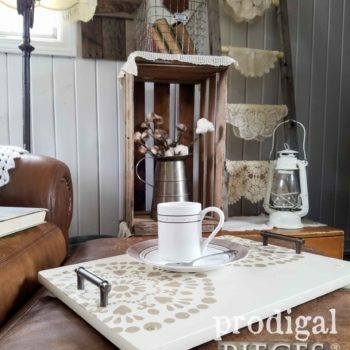 You might even consider painting your desk and chair so that all your furniture pieces are coordinated. 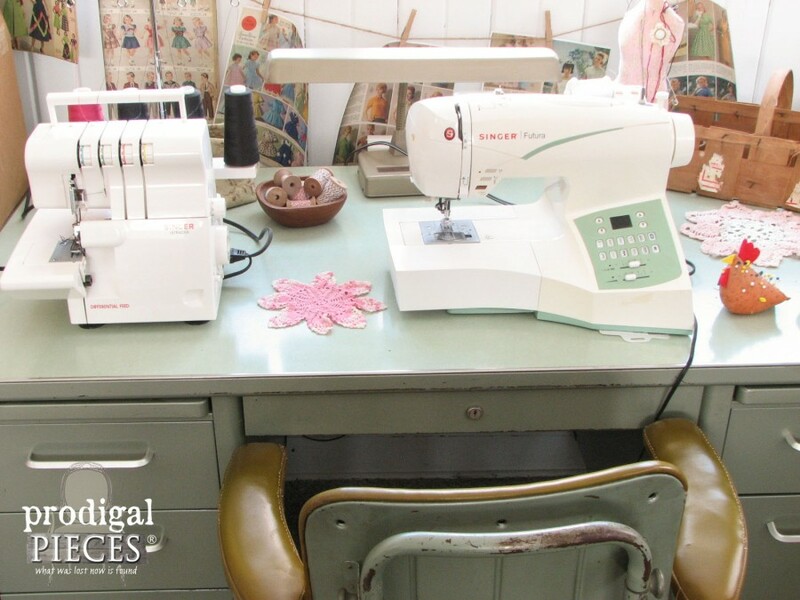 It’s such an easy and affordable way to update and coordinate your sewing room furniture. So happy for your good luck at finding these pieces for minimal $$$$!!!!!!! Hello Linda! Glad to have you stopping by. 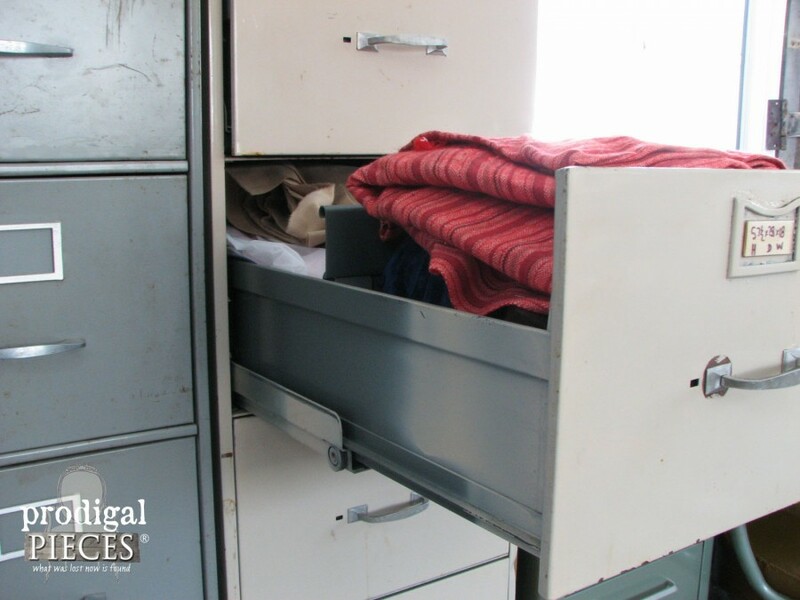 Yes, I adore my filing cabinets – they’ve help me regain some sanity to my stash. 😉 As for the rust, well…it’s a welcome thing in my house. The room the sewing storage is in has all sorts of rusty/found objects and though one may wonder why I would leave those cabinets like that, if I painted them all pretty they wouldn’t fit in. 🙂 Maybe one day they’ll have a dedicated room, but for now I thoroughly enjoy the stories they have to tell. Thanks for the tip! Super great idea..thank you for,sharing. I have several filing cabinets I can repurpose. I have just finished redoing my sewing/craft room by using the cheapest organization cabinets that I kept coming across. 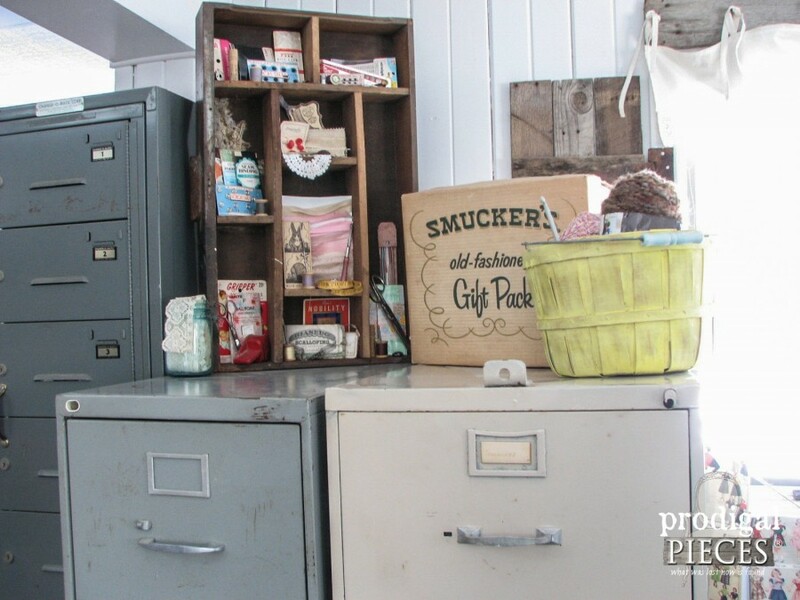 Old metal file cabinets and the metal credenza from a work space with attached file drawers. I love it. 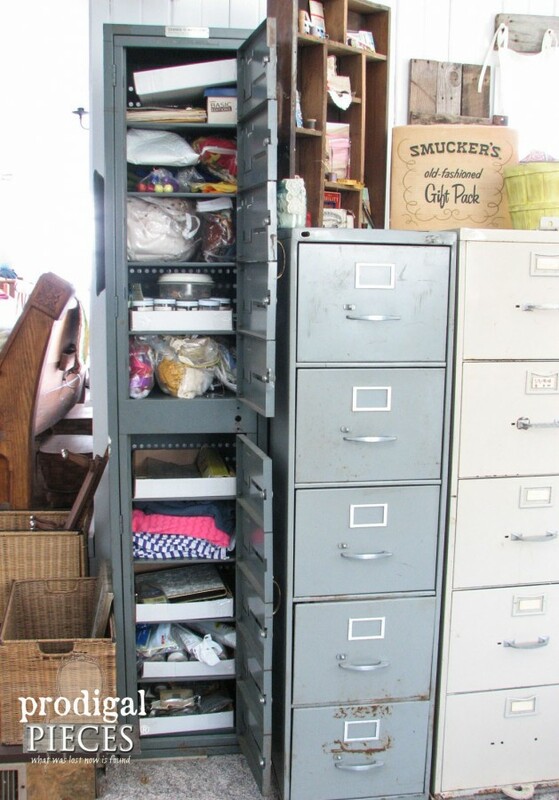 And then I am looking for ways to redo some more old US Army metal file cabinets (of which I seem to be both attracted to and addicted to) and I came across your pictures on a Google search. Rock On Sister!! My husband is now impressed. “Use it up, Wear it out, Make it do or Do without”! Cabinets are addicting for sure…endless possibilites. Sounds like you’re a gal after my own heart! I just wish I had a room! Bu I bought an old oak steno desk (it has a spring loaded shelf for a typewriter behind a door on the left where I will place my server) for my sewing machine and notions and a four drawer filing cabinet for fabric. Now thinking I should’ve got a lateral filing cabinet as the drawers are wider. Hi Samantha. I used standard and they held up just fine, but keep in mind I’m a hobby sewer. For a shop or boutique I would probably go heavy duty. I have a large file cabinet so now I know what to do with it! also it holding my old records right now .love your sewing room I don’t have one yet!! Yay!! That’s so fun to hear, Judy.